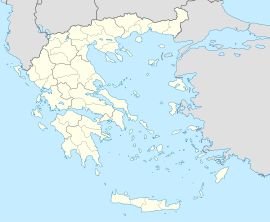 Amfilochia (Greek: Αμφιλοχία) is a town and a municipality in the northwestern part of Aetolia-Acarnania in Greece, on the site of ancient Amfilochia. Under the Ottoman Empire, it was known as Karvasaras (Καρβασαράς; from caravanserai). Amfilochia is situated by the Ambracian Gulf and features an amphitheatre. Amfilochia dates back to the ancient times and also features the ancient cities of Amphilochian Argos and Limnaia (or Limnaea). The municipality has an area of 1090.991 km2, the municipal unit 397.879 km2. Amfilochia is linked with the GR-5 (E55 and E951, Antirrio - Messolonghi - Ioannina) and is also linked with the GR-42 serving the extreme northwestern parts including Vonitsa, Preveza and the entire island of Lefkada. Amfilochia will be linked with the Ionia Odos. Amfilochia is not linked with a railway. This page was last edited on 19 December 2018, at 22:00 (UTC).